Hairston talked Treasure Island and a new city services system at her last ward meeting of the year. 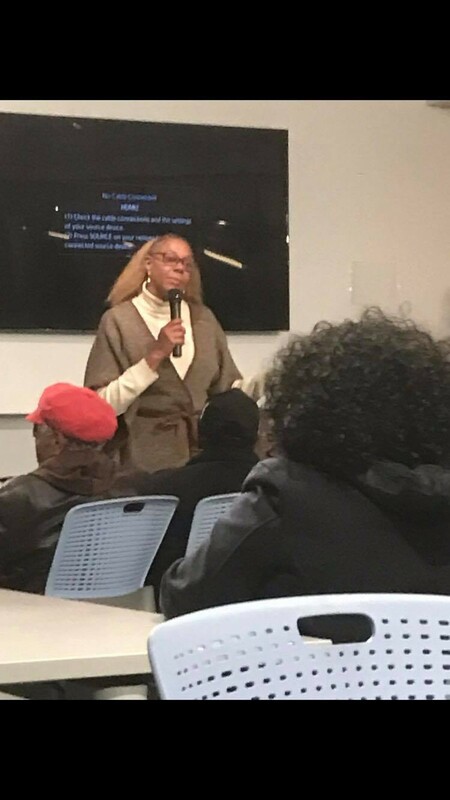 Long-tenured Fifth Ward Alderman Leslie Hairston engaged with community residents at her final ward meeting of the year last Tuesday at the Gary Comer Youth Center. Hairston addressed attendees’ questions regarding the sudden closing of Treasure Island and a new citywide service request system but quickly glossed over the topic of the Obama Presidential Center (OPC), which still faces a federal lawsuit and federal review. While she faces a challenger in the February city elections, the long-time alderman did not mention her reelection campaign. Hairston has been the Fifth Ward alderman since 1999 and defeated her most recent challenger by nearly 33 percent of the vote in 2015. Hairston kicked off the meeting by quickly touching on the OPC. The city council’s housing committee unanimously approved an ordinance to fund the OPC on October 11, and the full city council will vote on the ordinance this coming Wednesday. An ardent supporter of the OPC, Hairston said that the ordinance would include a community stabilization component to avoid potential displacement of residents. “It’s about uplifting the community and making sure that the people who have been here remain here,” she said. Hairston has not expressly supported the request for a Community Benefits Agreement (CBA) that would legally bind the Obama Foundation to requirements surrounding rent control and employment, which would potentially protect residents from displacement. The bankruptcy and subsequent folding of the beloved Hyde Park supermarket early in October left hundreds of locals without employment or health insurance. Treasure Island did not provide a notice 60 days in advance of the closure, as mandated of larger employers by the long-standing Illinois WARN Act. Hairston described the situation as “still kind of depressing” and pointed out that the lack of transparency on the part of the Treasure Island management has only added to the confusion. “People still have questions, and people still need answers,” Hairston said. She later noted that Treasure Island ownership has been uncooperative with regard to her calls and attempts to establish communication. However, Hairston also said that significant headway has already been made toward attaining employment for the displaced workers. During a previous community meeting, which focused more narrowly on the Treasure Island closure, several local grocers said that their businesses had job openings. Numerous grocers banded together and held a job fair just four days after that meeting. One attendee of the meeting said that these community-led efforts have already found new employment, as two former Treasure Island employees have since found opportunities at the Walgreens on 51st Street. Hairston then yielded the floor to sociologist Carol Adams, who detailed a plan to follow in the footsteps of Philadelphia and New York to update Chicago’s 311 City Services system. First launched in 1999, the program continues to have city residents submit service requests through paperwork. The updated system, which launches in January, will involve a mobile app and a revamped website, granting a more efficient and accessible experience for city residents. Hairston also touched on other recent efforts to improve community life in the ward, saying that she wants allocations for more mental health clinics in the city’s new budget. Mayor Rahm Emanuel submitted the budget on October 17, and the city is holding community hearings on the budget until December 31, after which City Council will vote on its approval. Emanuel’s budget includes a $1.4 million increase in mental health resources, but some aldermen and mayoral candidates have expressed the need for spending specifically on mental health clinics, as Emanuel has closed and consolidated clinics throughout his term. “There is a lot of money for the policing side, but there often aren’t matching funds on the support side,” Hairston said, arguing that mental health services are more effective for violence prevention. Hairston’s next ward meeting will be in January.